Home » Haven’t you taken Organization Alignment seriously yet? » Blog » Haven’t you taken Organization Alignment seriously yet? The very concept of alignment is common to everyone’s life. Consider organizational alignment as direction indicator for achieving success. From the very childhood days to adulthood days, how we organize and prioritize the things contribute a lot towards achieving a particular goal. And, this becomes even more prominent when you enter into the work life. Whether you are an HR manager, business owner or an executive, alignment matters for everyone as each one of us work towards a single goal directly or indirectly. 1) The work to be done on a whole. 3) The tools and technologies, resources and workflow to support the execution of a particular task. Organizational alignment covers a major share of the processes to be run in the company and so is the outcome. To cut the story short, you have to fuse the guiding elements including strategy, goals, objectives and activities with the driving elements including culture, values, practices, and behaviors to align all the resources towards the desired results. All you need to know is how to manage discipline in your organization without disturbing the positivity of the workplace’s environment. And this should be a continuous endeavor if you really want your organization to be productive for the years to come. 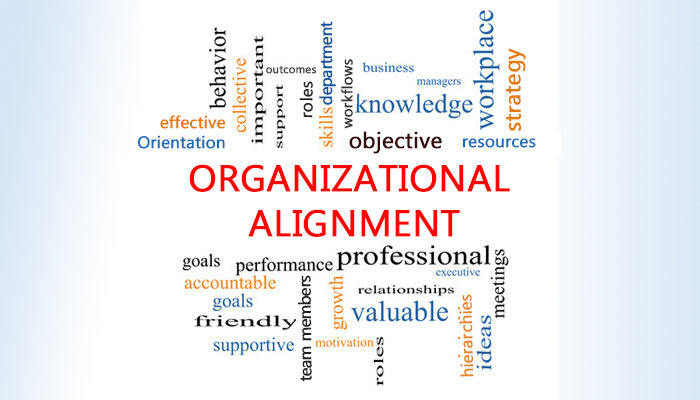 How to instill alignment in your organization? Just like a well-instructed recipe for chef-like food is required, to establish alignment in your organization you need a business strategy. The strategy should be clearly detailed in terms of roles assigned to different people, individual skills, and behaviors that will actually guide the path towards the desired results. Before organizing others, you first need to organize yourself in terms of what tasks to be assigned to whom in order to accomplish the goal of alignment. Once you have a clear picture in your mind about the hierarchy to be followed, be sure to communicate it to the people involved. Use as much of channels you can to make your voice heard by every member of your organization. This way you can intimate people about their responsibilities, the hierarchy they need to follow and the end result expected from them. More clarity your employee will have towards a goal, more efficiently they will perform. However, communication is equally important as goal setting. When we talk about a business goal, no single person or department can alone manage the process required. It is an accumulative process that requires different departments, teams, and business units to contribute. Defining the individual contributions clearly will boost the organizational development while helping you with the performance management at every level. No organization can bear the waste of time, efforts, and resources for conducting the activities that barely have any contribution towards the business goal. However, it is very important for organizational leaders to identify the on-going non-strategic processes and seize the opportunity to eradicate them. This way they can divert their capacity and skills to the strategic processes, making your organization more efficient. Here you do the real alignment by not only demonstrating people with their role and contribution but also by helping them analyze the effect of every step they take or task they do. It is prominently important to let your employees know how they are contributing to the final results. The very simple way to go about this step is creating individual goal sheets for different departments and teams that completely resonate with the BIG business goal you want to achieve. Also, providing performance guidelines will add to the performance. And this will strengthen the roots of organizational alignment at a deeper level (at employee level). If you want every process run smoothly, you need to have sufficient funds to invest in the resources – be it the wages of people who work for you or the cost of the requisite tools and systems. If your company’s budget will not be aligned with the overall development process, you could face hurdles in the way. The very common issue that mid-size or small companies have is falling short on hiring quality resources just due to lack of budget. The best way to overcome this issue is extensive of research to keep your firm updated with the recruitment and development trends so that you can reserve your funds accordingly. Keep in mind that establishing organizational alignment is a long-term process that requires a robust plan and focused vision. It is preferable that you make precise investments in quality tools like strategic HR products from Empxtrack, that covers a gamut of alignment services including succession planning, compensation management, workforce planning etc. More you will be specific towards establishing alignment in your organization, easier will be the goal achievement.